Your automatic transmission carries the engine power to the drive wheels using a series of gear sets, clutches, and bands. The brain of the transmission is the valve body, which responds to either hydraulic or electrical signals that instruct the transmission on when to shift. The pump is the heart of the transmission providing the hydraulic pressure needed for lubrication and applying the necessary amount of lubrication to friction devices. The transmission is the most complex component in your vehicles entire drive shaft. There are more than 1,000 moving parts and each must function flawlessly for the next piece to operate correctly. With so many moving parts it’s not hard to understand why maintenance is so important. Invest in regular fluid and filter changes and inspections and you’ll save yourself thousands of dollars in repairs. There is nothing cheap about repairing a transmission. Regularly check transmission fluids. See owner’s manual for servicing details. Check the transmission fluid anytime after it has been running hot. Hilly terrain, stop and go traffic, towing a trailer, and hot weather can all lead to excessive transmission heat that can lead to the loss of fluid, damage the fluid, or both. You should regularly check the fluid when the transmission has run hot. By regularly we mean the very next gas station. Install an external cooler. If you tow a trailer, find yourself continuously stuck in traffic, or regularly haul heavy loads can lead to excessive heat off the transmission. An external transmission cooler brings the transmission temperature down into the normal operating range, extending your transmissions life. Change transmission fluid often when vehicle used in high stress conditions. Your transmission fluid is designed to cool the transmission, clean, and lubricate the transmission parts while providing the hydraulic pressure so all the components can work together. When the transmission fluid is no longer able to efficiently carry out these tasks, the life of the transmission is significantly shortened. If your vehicle operates under high stress conditions it’s a good idea to change the transmission fluids twice a year. Have the transmission linkage checked and adjusted regularly. This is especially important for vehicles under heavy work load. Promptly have malfunctions checked. Transmission repair bills rise in relation to how long the vehicle is driven after the first signs of trouble. The longer you ignore a transmission that is acting up the more you can expect the repairs to cost. Make sure your engine is properly tuned. If your engine is not running properly the symptoms can sometimes resemble transmission issues. Have drive train components regularly checked. There are some drive train components that are directly related to the transmission functioning. Drive axles, universal joints, driveshaft’s, constant velocity joints, flex plates, flywheels, cooling system, computer system, engine mounts, transmission mounts, and sensors all play a role in your transmission functioning properly. Check cooling system twice a year. Have your cooling system checked for proper coolant strength, levels, and leaks. Antifreeze deteriorates over time so it needs to be replaced to keep its effectiveness. Annually have a complete physical on your vehicle. Annually your vehicle should be checked from top to bottom including brakes, steering, lights, and other safety components. There are all kinds of things that can happen to a transmission and many of these repairs can be very costly. There are a number of symptoms that indicates there may be transmission problems in the future. Let’s look at the top 20 symptoms. Shifter doesn’t go into drive or reverse. You place the shifter into driver (D) or reverse (R) but nothing happens. When the vehicle is cold and you put it into driver there is a delay. The vehicle shifts late during the first couple of minutes of operation. You cannot get the shifter to go into any position. Even when the engine is racing it doesn’t move. Fresh stains under your vehicle. Slippage. The engine rpm is high but the vehicle moves very slowly and will not accelerate. Shifting occurs at the wrong speed levels resulting in early or late shifting. 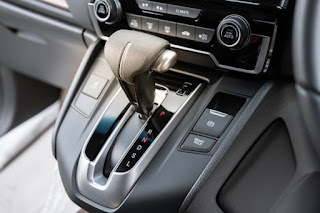 Rough shifting that causes clunking or a rough feeling when the transmission is put into gear. Unable to put into passing gear, or it goes into overdrive but there is no surge in power when you give it gas. There is a burning smell or rancid smell. Erratic shifting. Speed where shifting occurs is never the same. Vehicle attempts to move when in park. Engine braking doesn’t work in one or more positions. Vehicle stalls on take off. Check engine or service engine light keeps coming on. The shifter has become difficult to move out of or into any position. The shifter indicator no longer points to the correct gear. The shifter indicator is slightly off neutral (N) and/or park (P) when you go to start the car. You are hearing strange noises. Grunts, groans, hisses, etc. When inspected, here is an excessive amount of debris and filings in the transmission pan. Never leave your vehicle in park without putting your parking brake on. If your vehicle was even just tapped by another vehicle it could result in the parking pawl, a part inside your transmission, to break and your vehicle would roll. Unattended this could cause significant damage. Never brake by downshifting. It’s a common practice to downshift at traffic lights rather than using brakes. A forced downshift at a higher RPM cause excessive wear on the transmission clutches and bands. Never shift from drive into reverse when the engine is at a fast idle. This abrupt engaging of the transmission can result in failure of the bands, clutches, driveline components, and gear sets, as well as transmission and engine mounts. Don’t drag race. If your vehicle was designed for racing that’s fine but stock transmissions and drivelines aren’t designed for that type of torque or abuse and you could damage your transmission and a number of driveline components. Never rock your car in the snow or sand. Dig yourself out or get towed but don’t do that rocking from reverse to drive that you see so many people doing. The excess heat that this causes can result in burning your transmission out in short period of time. A tow is far cheaper! Don’t drive until your engine has warmed up. For your transmission to be properly lubricated the fluid needs to be at operating temperature. It may take you a few minutes longer to get going but it will save you a large transmission bill. Never tow your vehicle with the drive wheels on the ground. Front wheel drive vehicles must have the front wheels in the air. Rear wheel drive vehicles must be towed with the rear wheels off the ground. Four wheel or all wheel drive vehicles need to be towed flat. Refer to your owner’s manual for proper towing direction to avoid serious damage. Never stop suddenly. Sudden stops (and fast starts) can result in damage to your drive train and its components including transmission and engine mounts, and direct transmission damage. Don’t try to fix your own transmission. Over the counter quick fixes in the form of additives that are designed to make your transmission shift better or stop leaks contain a lot of different chemicals that can cause seals that are already worn to become swollen, or they can affect the function of rubber parts that lead to more serious damage. It doesn’t pay to play around because you can cause more damage and the end result will be a bigger repair bill then if you had just visited the transmission shop. Get regular maintenance. Make sure your transmission gets the regular servicing it needs to stay in good operating condition. Your vehicle has normal sounds that you become comfortable with. When those sounds change you’ll probably notice it pretty quickly. If you experience a new sound that you have not previously heard it could the start of a problem. Here are the top 10 sounds to be aware of.